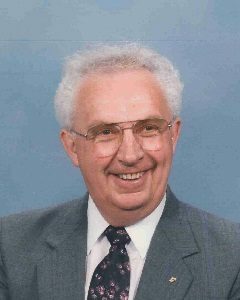 Frank J. Fay, age 91, of Hutchinson, Minnesota, passed away Wednesday, January 30, 2019, at Harmony River Living Center in Hutchinson. Funeral Service will be held on Tuesday, February 5, 2019, at 10:30 A.M. at Christ the King Lutheran Church in Hutchinson with interment in Oakland Cemetery in Hutchinson. Visitation will be held on Monday, February 4, 2019, from 5:00-8:00 P.M. at Dobratz-Hantge Funeral Chapel in Hutchinson and will continue one hour prior to the service at the church. Frank John Fay was born on August 31, 1927, in York, North Dakota. He was the son of Francis “John” and Gunda (Ledfors) Fay. He was baptized as an infant and confirmed in his faith as a youth. He received his education at Rugby High School and was a graduate of Rugby High School Class of 1945. He furthered his education at Minot Business College for two years. Frank entered active military service in the United States Naval Service on May 11, 1945, in Minot, North Dakota. He served his country during World War II. He received Honorable Discharge on June 16, 1946. He achieved the rank of Seaman First Class USNR V-6. Frank reentered active military service in the United States Air Force on January 10, 1951, in Fargo, North Dakota. He served his country during the Korean War. He achieved the rank of Staff Sergeant E-5. He received Honorable Discharge on January 9, 1955, at Offutt Air Force Base in Nebraska. In 1949, Frank was united in marriage to Lillian Erickson. This marriage was blessed with four daughters, Becky, Colleen, Cheryl and Kathy. On December 28, 1995, Frank was united in marriage to Margaret (Houg) Lenz. Frank and Margaret resided in Hutchinson, Minnesota. Frank and Margaret spent 10 years vacationing in Winter Haven, Florida. They shared 24 years of marriage. Frank began his professional career in feed sales. He and his family moved to Hutchinson in 1965, where he started working at Harvester Silo. In 1967, Frank started his career as a self-employed realtor in Hutchinson for many years. He was a member of Christ the King Lutheran Church in Hutchinson. Frank enjoyed hunting, golfing, sports and traveling. He was very active in the Hutchinson American Legion Post 96; where he served as Post Commander in 1974-1975. He also held the position of State Commander of the American Legion in 1980-1981 and enjoyed his time with the King Tuts. Frank was very involved in the Midwest Kidney Foundation and served as Chairman of the Board in 1993-1998. He was also a member of Masons & Shriners and Past President of Hutchinson Chamber of Commerce. Frank was involved with AA and served as a mentor to many. He celebrated 44 years of sobriety. Frank passed away on Wednesday, January 30, 2019, at Harmony River Living Center in Hutchinson, Minnesota at the age of 91 years. Frank is preceded in death by his Parents, Francis and Gunda Fay; Sons-In-Law, Wally Hombach, Joe Dooley; Sister, Elizabeth Jones, Brothers-In-Law, F.E. Jones, Lester Drege, Bruce Shuler, Don Monger, Everett Jelleberg. What a great guy! Over the last years, we visited with Frank many times at Fern Pathway. He enjoyed going to Chapel on Sundays and to listen to Jim Nelson play music.. He always had a smile on his face. Loved to read the newspaper! In addition to Margaret, he really loved his faithful daughters. We got to have some of his last birthday cake! Now he is able to golf in Heaven~~~Peace to all of the Fay family. Sorry and condolences to the family. A wonderful life he had. May he rest in peace. My sincerest condolences to your family. Frank left a lasting impression in my life through my many visits to the Hutch Cafe. Always with a smile on his face and interested in all the things a young boy had on his mind when I was told to only speak when spoken to as to not annoy all the men in their conversations to solve the worlds problems. Frank was always there to give advice, listen and encourage me to attain goals that did not seem possible to my young mind. There is now a void on the earth for losing him, but his memory will carry on with the impact he had on many lives and the Hutchinson Community as a whole. Prayers from the Popp Family to yours. Stephanie, I’m sure you will miss your grandfather very much. Hope you have many good memories of him. My deepest sympathy and prayer for everyone! I always thought the world of Frank. Sorry we won’t be in state next week for services. Keep his memory close to your heart. Colleen, your dad is in my prayers. I hope you and your family can be comforted by loving memories. Although it has been many years since I have seen Frank and Margaret, I always remember Frank with the way he always made you feel involved in whatever was happening. He remembered everything you said and discussed many things with you. I am sorry for your loss Margaret (I know Mom and Dad also send their condolences). May Frank rest in peace with his heavenly family…just wait till we join him, look at all the things he will have to say to us! Much love! DEAREST SYMPATHY TO THE FAY FAMILY I AND MARLENE ARE HAVING THE FLU SORRY FOR NOT ATTENDING HIS FUNERAL. FRANK WAS MY AA SUPPORTER .. I HAVE LOTS OF THANKS FOR THAT. We send our deepest sympathy in the loss of your Dad…..
We have great memories of the fun we had in Florida, in fact, it was your Dad and conversations at Hutch Cafe that brought us to Four Lakes, our winter paradise. We bought our first house from your Dad. AND, do you know how busy your Dad is now…….because he knows everyone in heaven and can you just see the smile on his face when he greets everyone up there…and with some humor…..he was at their funeral!!!! We are so sorry to get the news about Frank……but I can see the smile on his face as he greets everyone in Heaven. We have so many great memories of Four Lakes friends, getting together and laughing and having fun. We will all be together doing that again some day! Take care of yourself…..sending love and hugs. Love from the Dahnke family! Just heard about Frank. We are so sorry to hear about Frank’s passing. So many good memories. Mom received a Christmas card from Margaret and she updated her about Frank and family. Will never forget that Frank and Margaret were the last friends to visit dad (Don) in the hospital before he passed away. Love to all of you. Our sincere condolences.